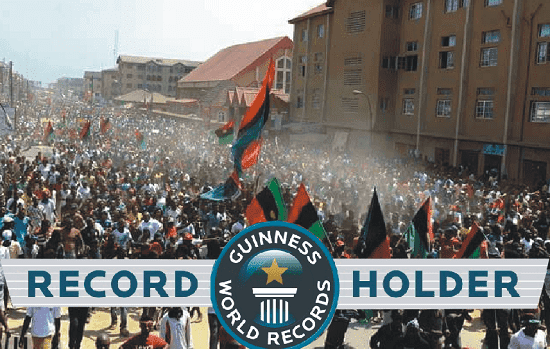 The Indigenous People of Biafra (IPOB) has said entered the Guinness book of records for be­ing the only freedom fighting organization to organ­ise first peaceful protests worldwide at the same time and hour since the creation of the universe. The group noted that they achieved the feat be­cause members were dedicated and committed to the noble project of restoring the Biafra state. 1. IPOB has the most powerful radio station in the whole world. 2. IPOB is one of the richest organisations in the whole world, rich enough to rebuild the whole of Nigeria. 3. IPOB has a secret government you know nothing about, allow Biafra and we'll start elections. 4. IPOB has the most powerful leader in Africa. 5. IPOB has no equal alternative organization. 6. 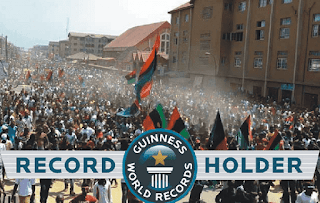 IPOB has more unregistered supporters than registered supporters. 7. IPOB does not pay it's members, it's a voluntary organisation yet it is the biggest and most populous organization in the whole world as it is found in over 100 countries. 8. IPOB has more sabotage within yet they're not significant enough. 9. IPOB stands for the needs of the whole of Africa including Nigeria. 10. IPOB is not fighting for Nnamdi Kanu. IPOB owns Nnamdi Kanu. 12. IPOB will break Nigeria.